Piping hot, freshly roasted butternut squash is a classic favorite of mine on a cold wintry evening. And I’m a big fan of cheesy pasta any time of the day, any month of the year. So it was surely only a matter of time before I decided to combine the two into one rich, yummy bowl of cold-weather comfort food. The best part: this is a creamy, cheesy, satisfying pasta dish that’s also healthy and nutrient-rich (full of vitamin A, vitamin C, calcium, fiber, protein, and the list goes on and on…)! Here’s everything you’ll need to make this tasty dish. Grab a couple of cloves of garlic. Place your knife flat over the cloves and press down with your palm or fist, smashing the cloves, and breaking off the skin. There’s no need to chop up the garlic cloves in this recipe, just leave them whole. Next, grab a shallot, chop off both ends, and cut it in half lengthwise. Peel off the skin and chop each half in half again, so you end up with large pieces. I love using shallot in this recipe because it adds tons of onion-y flavor, but it’s far more delicate (and slightly sweeter) than a plain old onion – – the perfect complement to butternut squash! Next up: the butternut squash. It’s time-consuming, hard work to peel and chop the squash. Truly. Enough to make you want to abandon cooking with it, unless you’re a pro in the kitchen. Don’t give up on butternut because of this! Just take the short-cut: buy the packaged, peeled and chopped butternut – all the work has been done for you. Grab a baking sheet and line it with parchment paper. Then toss the squash, whole garlic cloves, and shallot onto the baking sheet and drizzle some olive oil all over everything. Add some salt and pepper and a bit of dried thyme. Use your hands to toss everything together, making sure everything is equally coated in oil and seasoning. Then arrange the squash on the pan so no two pieces are overlapping, and they’re off to the oven to roast. Meanwhile, grab a block of parmesan and grate it up. When the squash is just tender enough to be pierced with a fork, pull the baking sheet out of the oven and drizzle a bit of dry white wine all over everything. Then carefully place the baking sheet back in the oven to cook for just a few minutes more, allowing the wine to reduce. In the meantime, boil a large pot of water. Salt the water and toss in some whole wheat penne pasta. Cook until it’s just al dente. When the white wine has nicely reduced in the oven, after just a few minutes, pull the baking sheet out of the oven and toss everything into a food processor or blender. Purée the mixture until everything is smooth and creamy. Then add a couple of tablespoons of extra virgin olive oil and a bit of low-fat milk, and purée again until the sauce is nicely blended. 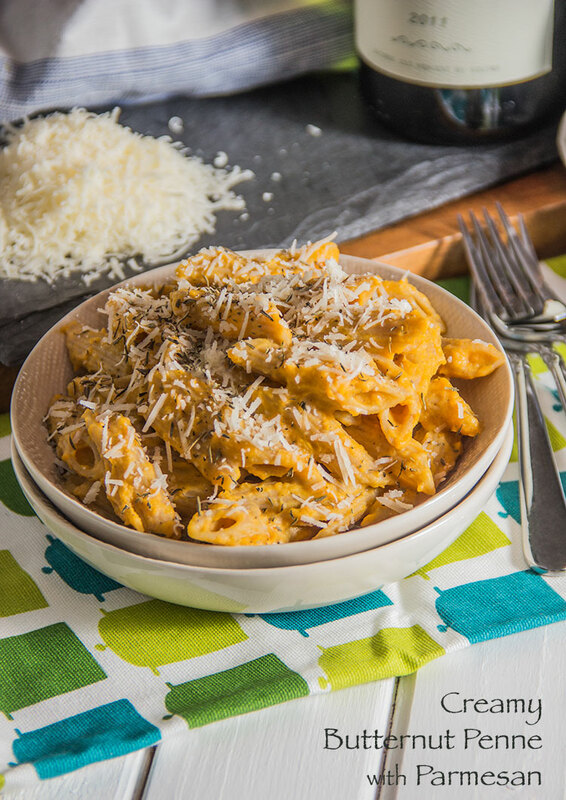 Grab a large bowl, toss in the cooked penne, then stir in the creamy butternut sauce. Add plenty of grated parmesan and serve immediately, while it’s still nice and warm! The thick, velvety butternut sauce is savory, slightly sweet and richly flavored with the white wine, garlic, shallot, and thyme. And the parmesan, of course, adds tons of cheesy deliciousness. It’s a comforting bowl of pasta that’s packed full of nutrition too! Add the garlic cloves, quartered shallot, and chopped butternut to a parchment-lined baking sheet. Drizzle on 2 tablespoons of olive oil and season with dried thyme, salt and pepper. Toss and combine everything, ensuring squash is well coated with oil and seasoning, then arrange squash flat on the pan so that no two pieces are overlapping. Roast in the oven for about 20 minutes, or just until squash is tender enough to be pierced with a fork. Remove baking sheet from oven and drizzle white wine over the squash. Place back into the oven to cook for about 5 minutes more, or until white wine is reduced. Meanwhile, boil a large pot of water. Salt the water and toss in some whole wheat penne pasta. Cook until it's just al dente, and drain. While the past cooks, pour the roasted squash mixture into a food processor or blender and purée until smooth and creamy. Add ¼ cup extra virgin olive oil and the milk, and purée until smooth. Season to your taste with salt and pepper. Pour the butternut sauce into a large bowl and carefully stir and combine in the cooked penne. Add the grated parmesan and serve immediately, while still warm. Mmm! This sounds delicious and healthy! I’m so going to try this! This looks and sounds like the perfect comforting winter meal! And healthy to boot. Yum! I tried it and it was really really yummy..just added a bit of ricotta left over from a spinach-ricotta ravioli recipe. Love the idea of penne with butternut squash…..looks amazing! Oh man, how doesn’t this have like 3 million pins?! It looks WONDERFUL! I’ve yet to try butternut squash, but I really have to get on that bandwagon! I don’t understand where 18g of protein come from? What is the serving size? Yes, that’s right – I try to keep vegetarian dishes high in filling protein. 🙂 The majority of the protein in this dish comes from parmesan (also high in calcium) and whole wheat penne (also high in fiber). The yield for this dish is eight servings, which works out to approx. 1/4 cup of parmesan and 2 ounces of whole wheat penne per person. It has been a while since I last landed here. This is something I will try out soon. Butternut is such brilliant vegetable. Love the color of it too.. I hope that you and your boys … are doing just fine – and that life treats you all very gentle. I love butternut squash! Looks delicious.